Italian Ryegrass (Lolium perenne ssp. multiflorum) is a monocot weed in the Poaceae family. In Idaho this weed first evolved multiple resistance (to 3 herbicide sites of action) in 2005 and infests Canola, Chickpea, Lentils, Peas, and Wheat. Multiple resistance has evolved to herbicides in the Groups A/1, B/2, and K3/15. These particular biotypes are known to have resistance to clethodim, clodinafop-propargyl, diclofop-methyl, flufenacet, quizalofop-P-ethyl, and triasulfuron and they may be cross-resistant to other herbicides in the Groups A/1, B/2, and K3/15. Field, and Greenhouse trials comparing a known susceptible Italian Ryegrass biotype with this Italian Ryegrass biotype have been used to confirm resistance. For further information on the tests conducted please contact the local weed scientists that provided this information. There is no record of differences in fitness or competitiveness of these resistant biotypes when compared to that of normal susceptible biotypes. If you have any information pertaining to the fitness of multiple resistant Italian Ryegrass from Idaho please update the database. The Herbicide Resistance Action Committee, The Weed Science Society of America, and weed scientists in Idaho have been instrumental in providing you this information. Particular thanks is given to Donn Thill for providing detailed information. Menegat, A., G. C. Bailly, R. Aponte, G. M. T. Heinrich, B. Sievernich, and R. Gerhards. 2016. Acetohydroxyacid synthase (AHAS) amino acid substitution Asp376Glu in Lolium perenne: effect on herbicide efficacy and plant growth.. J Plant Dis Prot DOI 10.1007/s41348-016-0023-2 : . Recently, the acetohydroxyacid synthase (AHAS) amino acid substitution Asp376Glu was detected in a Lolium perenne population originating in France. This is the first documented occurrence of the Asp376Glu single- nucleotide polymorphism in a Lolium species. The effects on herbicide efficacy and plant fitness are presented. Separation of the original population into different genetic subgroups allowed the comparison of different L. perenne AHAS genotypes according to their susceptibility to AHAS-inhibiting herbicides. Root and shoot biomass accumulation as well as tiller production was analysed for resistant and sensitive populations. Genotype-specific AHAS activity and inhibition were studied in vitro, using recombinant Arabidopsis thaliana DNA. Plants expressing the AHAS Asp376Glu genotype were resistant against mesosulfuron ? iodosulfuron, pyroxsulam and propoxycarbazone. To imazamox, reduced susceptibility for dosages below 140 g a.i. ha-1 was observed. In the absence of herbicide, no significant impact of the Asp376Glu genotype on shoot biomass and tiller accumulation could be observed, whereas root biomass of the Asp376Glu genotype was significantly reduced by 68 % compared to the AHAS genetic wild type. The AHAS enzyme study revealed reduced AHAS enzyme rate of 48 % for the Asp376Glu genotype compared to the AHAS genetic wild type. This study highlights the role of the amino acid exchange on resistance profile against the most relevant AHAS-inhibiting herbicides. First indications were found that fitness of the Asp376Glu genotype is hampered..
Ghanizadeh, H. ; Harrington, K. C. ; James, T. K. ; Woolley, D. J.. 2013. Confirmation of glyphosate resistance in two species of ryegrass from New Zealand vineyards. New Zealand Plant Protection 66 : 89 - 93. Plants were obtained from two populations of Italian ryegrass (Lolium multiflorum) and three populations of perennial ryegrass (Lolium perenne) from different vineyards in Marlborough and Nelson that were suspected of being resistant to glyphosate following many consecutive applications of this herbicide over recent years. Each population was multiplied by splitting out tillers, and this was also done for plants taken from a population of each species from Manawatu pastures where they had not been exposed to glyphosate application. A dose-response experiment showed that four populations taken from the vineyards were about 10 times as resistant to glyphosate as those plants that had not been previously exposed to the herbicide. The experiment was repeated and showed one perennial ryegrass population to have a 30-fold level of resistance. These are the first confirmed cases of glyphosate resistance within New Zealand..
Salas, R. A. ; Burgos, N. R. ; Mauromoustakos, A. ; Lassiter, R. B. ; Scott, R. C. ; Alcober, E. A.. 2013. Resistance to ACCase and ALS inhibitors in Lolium perenne ssp. multiflorum in the United States. Journal of Crop and Weed 9 : 168 - 183. Lolium perenne ssp. 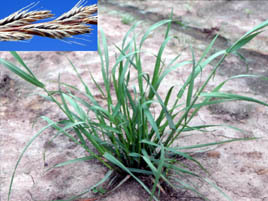 multiflorum (Italian ryegrass) is a major weed problem in wheat production. Being an obligate outcrossing species, it has a high propensity to evolve resistance to herbicides. This study was conducted to determine the level of resistance and resistance patterns of Italian ryegrass populations in the United States to ACCase- (diclofop and pinoxaden) and ALS (imazamox, mesosulfuron, and pyroxsulam) inhibitors. Dose-response bioassays were conducted on 47 populations from suspect herbicide-resistant fields in the southern United States (Arkansas, Mississippi, Georgia, North Carolina, South Carolina, Virginia), Kansas, and Washington collected between 2008 and 2011 from fields suspected of resistance to ALS inhibitors. Eighty-seven percent of the populations were resistant to diclofop. Eight of the diclofop-resistant populations (25%) were also resistant to pinoxaden. Thirty-eight diclofop-resistant populations (81%) were resistant to at least one ALS inhibitor. Thirty-nine populations (83%) were resistant to mesosulfuron, 38 of which were also resistant to pyroxsulam. All mesosulfuron-resistant populations tested were cross-resistant to imazamox and pyroxsulam. Cross-resistance patterns to ALS inhibitors differed. Of 45 populations with resistance to ACCase or ALS inhibitors, 35 (78%) had multiple resistance to both modes of action. The majority of diclofop-resistant L. perenne populations can be controlled with pinoxaden, but widespread resistance to pinoxaden can evolve soon if it is intensively used. A comprehensive weed management approach prior to planting will be critical in managing L. perenne in wheat and preventing or delaying resistance evolution..
Wu JinXia ; Zhang ZhiGuo ; Zhang Qian ; Lang ZhiHong ; Sun XueHui. 2012. Scarabaeid larvae- and herbicide-resistant transgenic perennial ryegrass (Lolium perenne L.) obtained by Agrobacterium tumefaciens-mediated transformation of cry8Ca2, cry8Ga and bar genes. Journal of Integrative Agriculture 11 : 53 - 61. Insect pest and weeds are two major problems for forage and turf grasses. In this study, scarab larvae- and herbicideresistant transgenic perennial ryegrass (Lolium perenne L.) was obtained by transforming it with cry and bar genes simultaneously via the Agrobacterium-mediated method. To optimize the callus induction and plant regeneration conditions, various concentrations of 2,4-dichlorophenoxyacetic acid and 6-benzylaminopurine were assayed. The transformation efficiencies of different Agrobacterium suspension media, used during Agrobacterium-mediated transformation, were compared. Then, plasmids of pCAMBIA3301 containing cry gene (cry8Ca2 or cry8Ga) and bar gene, driven by ubiquitin promoter, were transformed into perennial ryegrass. The transformants were generated and confirmed by both Southern hybridization analysis and Western hybridization analysis. Further, the resistance of transgenic perennial ryegrass plants to scarab larvae and herbicide were analyzed. After 30 d of co-cultivation with scarab larvae, the damage to the root system of transgenic plants was less than that of non-transgenic control plants. Additionally, the leaves of transgenic plants were resistant to Basta®, while leaves of the wild plants wilted after Basta® spraying. These results show that cry gene and bar gene were successfully transferred into perennial ryegrass by the Agrobactgerium-mediated method, and convey resistance to scarab larvae and herbicide in transgenic perennial ryegrass plants..
Baldwin, C. M. ; Brede, A. D. ; Mayer, J. J.. 2012. 'JS501' and 'Replay' perennial ryegrass glyphosate tolerance and rates required for annual bluegrass (Poa annua L.) control. HortScience 47 : 932 - 935. Incorporating the use of glyphosate into a weed management program offers turfgrass managers increased flexibility and cost savings when attempting to control troublesome weeds such as annual bluegrass (ABG) (Poa annua L.). Field trials of glyphosate tolerant perennial ryegrass (PRG) (Lolium perenne L.) cultivars, JS501 and Replay, were initiated to determine glyphosate tolerance and rates required for ABG control. In the tolerance trial, glyphosate was applied on 15 Sept. 2010 and 9 Aug. 2011 at rates of 0, 0.29, 0.58, 1.16, 1.74, 2.32, and 3.48 kg.ha-1 a.e. Glufosinate was also applied at 0, 1.68, and 3.37 kg.ha-1 a.i. In the ABG control trial, glyphosate was applied on 17 June followed by 19 Aug. 2009 and 25 June followed by 25 Aug. 2010 at rates of 0, 0.15, 0.29, 0.44, and 0.58 kg.ha-1 a.e. In the tolerance trial, linear regression analysis revealed a glyphosate application rate of 0.81 kg.ha-1 a.e. was required to cause 20% leaf firing. By the end of the trial, the highest rate of glufosinate resulted in nearly complete desiccation of 'Replay' PRG. For ABG control, after four glyphosate applications over a 2-year period, a rate of 0.29 kg.ha-1 a.e. or greater resulted in less than 10% ABG. Untreated plots had ~83% ABG infestation. Discoloration was not noted for either PRG cultivar at any point over the 2-year trial period. Based on the environmental conditions of each trial, results suggest a recommended application rate should be 0.29 kg.ha-1 a.e. during summer months. This rate is sufficient for ABG control and also provides protection in case spray overlap occurs during an application..